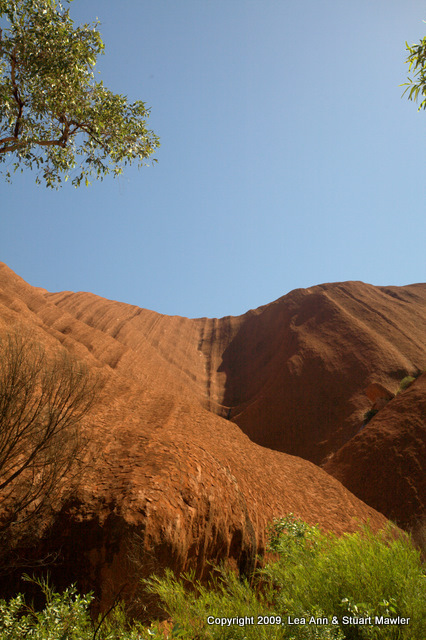 We awoke bright and early (practically early enough to be the day before, by Mawler standards) to get to Uluru before it was way too hot. After a brief stop at the visitor's center, we stopped at one of the short trails called the Mala Walk, which leads to the Kantju Gorge. 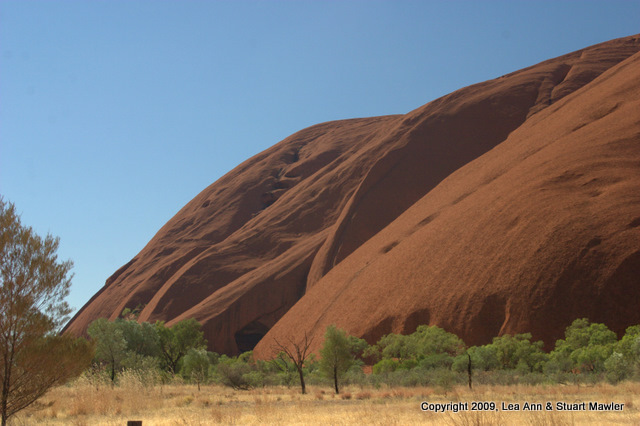 As you can see from the picture ot the right, it is almost impossible to get any sense of the size of the rock, when you are right up next to it. This also happens to be the head of the trail to the top of the rock, which we did not climb. 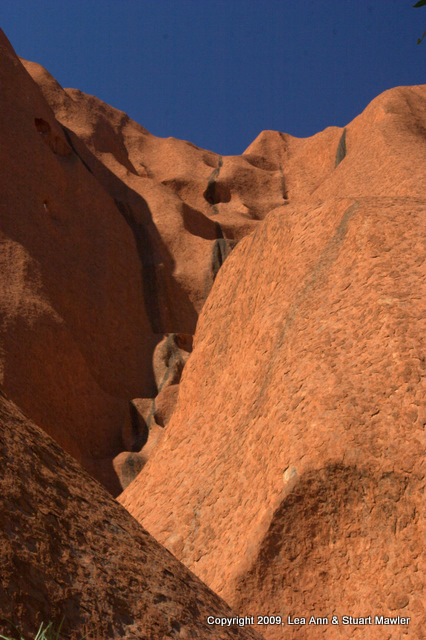 The walk to the Kantju Gorge was full of interesting perspectives on the rock, which changes from moment to moment across the day. 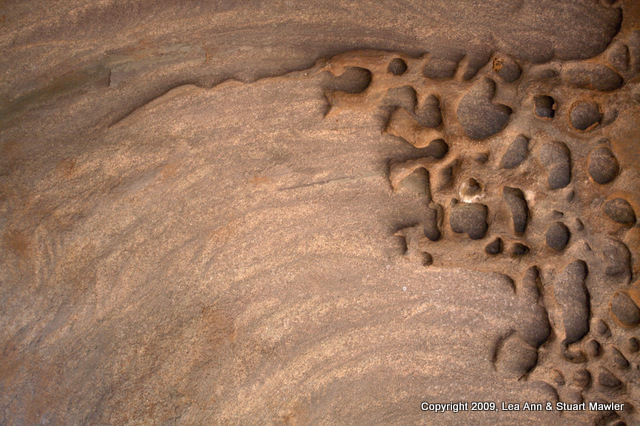 In the early and late light, fissures in the rock make excellent patterns. 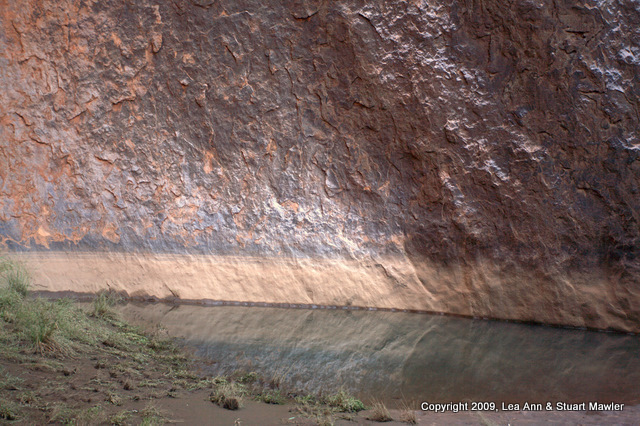 This is one of the channels made in the surface of the rock by running water. 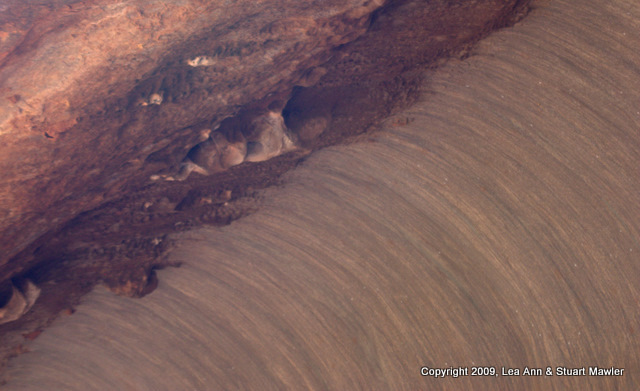 This wave-looking abstract picture is the edge of a "cave" with a portion of the cave roof / back wall showing in the lower right. 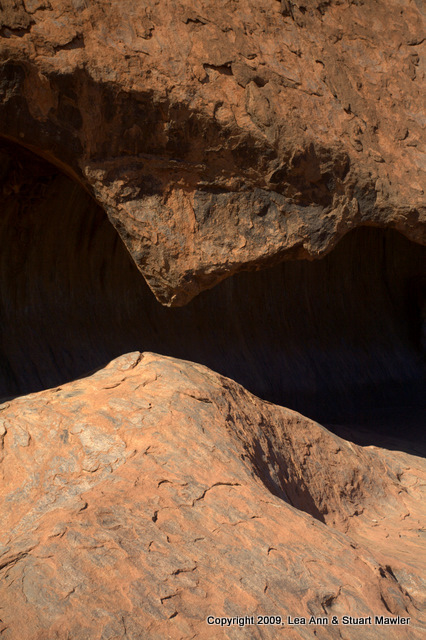 The cave is more of an overhang, much like a breaking wave, and is probably three meters (or more) tall. The cave roof / back wall is nearly smooth. 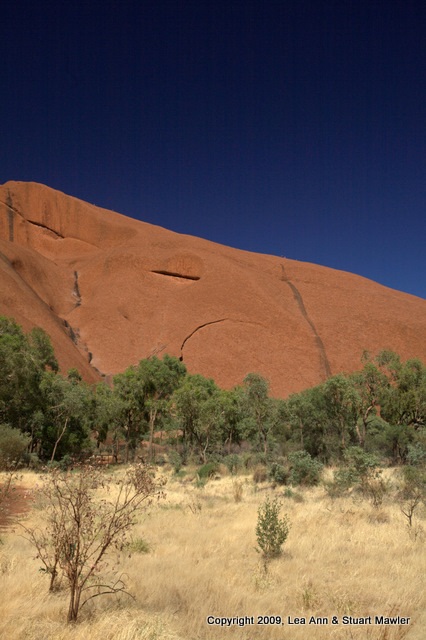 The subtle colors on the rock are amazing, particularly where it has been smoothed by water. 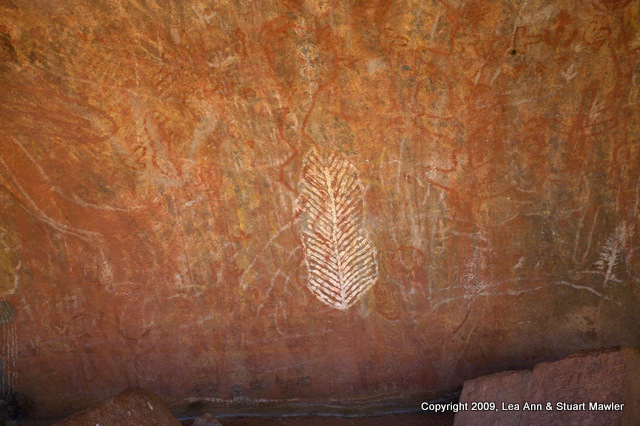 Since the rock is sacred, finding Aboriginal paintings is not too surprising. "Solo! Hay lapa no ya, Solo!". 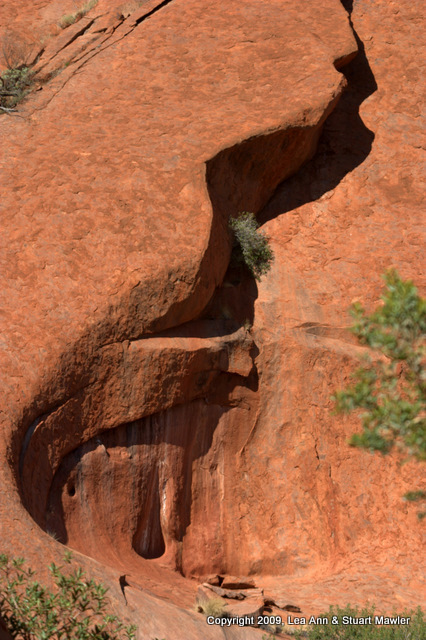 Looks like Jabba the Hut, doesn't it? 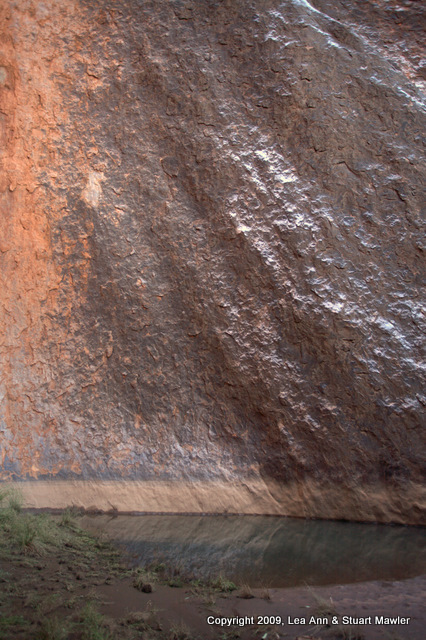 Arriving at the Kantju Gorge was completely worth it. 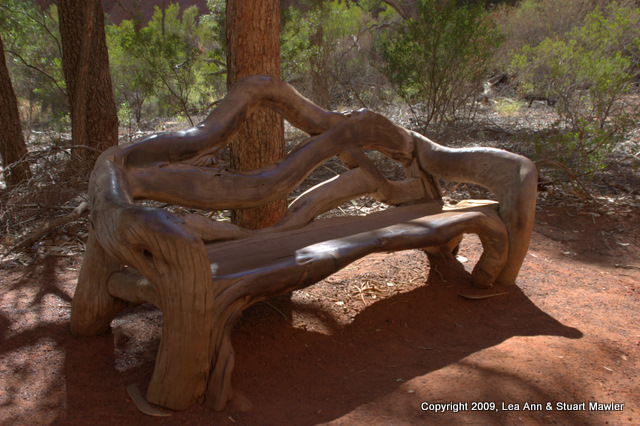 On the way to the gorge, the park provides this excellent looking and extremely comfortable bench. Most heartily recommended for enjoying the stillness of the area. Well, the stillness between busloads of tourists, anyway. The waterfall down the gorge. 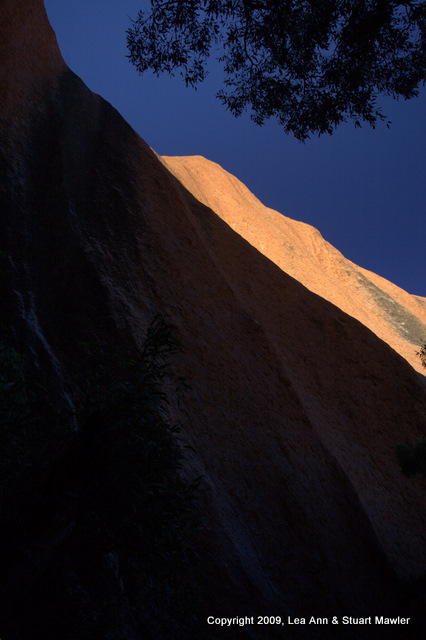 The contrast between the shade of the gorge and the full sun on the top of the rock is striking. The rock just seemed to glow in the indirect light of the gorge. We made several attempts to capture the glow, but could only approximate the in-person beauty. The gorge is not only quiet and shady, but has water. As you can see, there is little of that precious liquid, making it even more valuable, while still offering nice reflections. 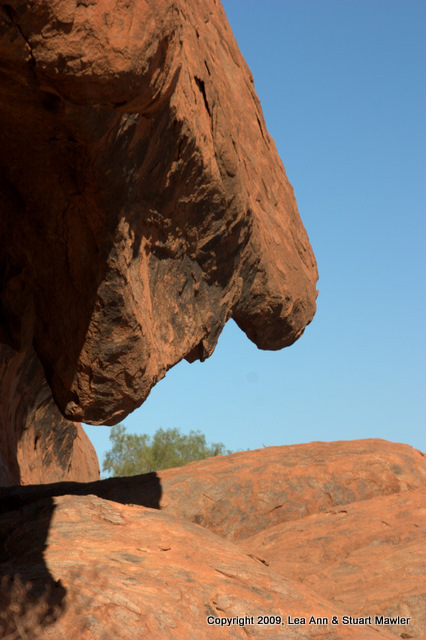 And there were still more interesting perspectives to be had on the rock. 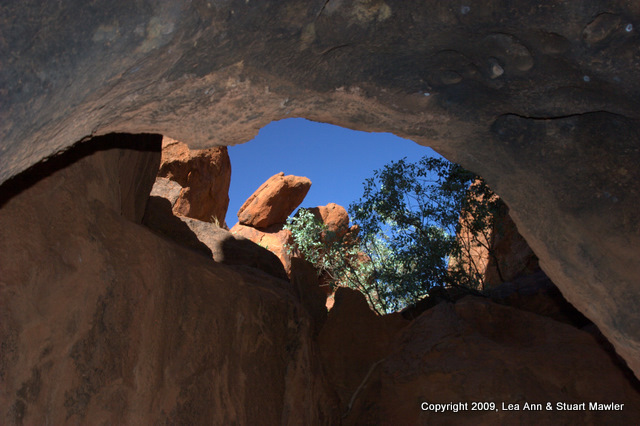 Many views were so abstract that we could imagine faces and other scenes in the rock. 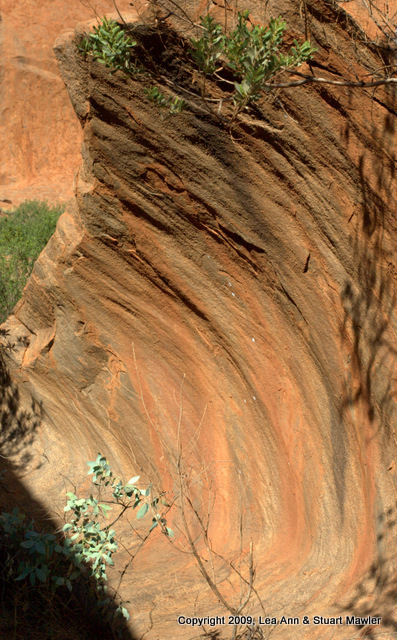 In this frame, a face appears to be leaning down to look at the rock below. The texture of the rock just demanded repeated pictures. 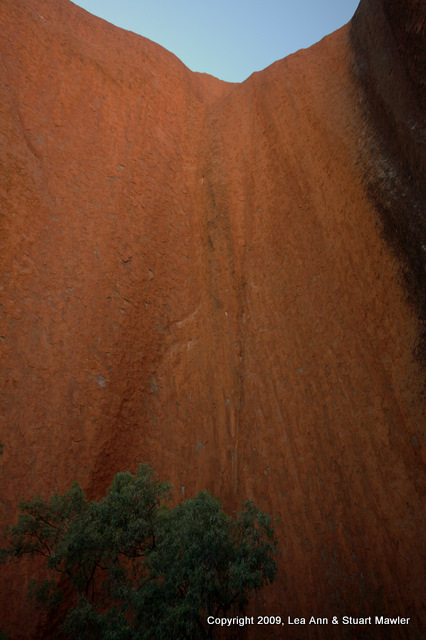 In this frame, the dark line is where water runs off the rock after a rain. 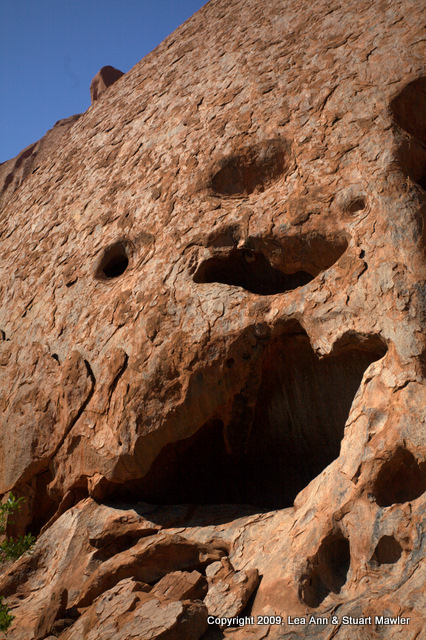 This pattern was on the roof of a small cave in the side of the rock. Nature is the best graphic designer. The contrast of the white (probably droppings) on the red seemed noteworthy. In this picture, the rock is laughing at us. See the face? 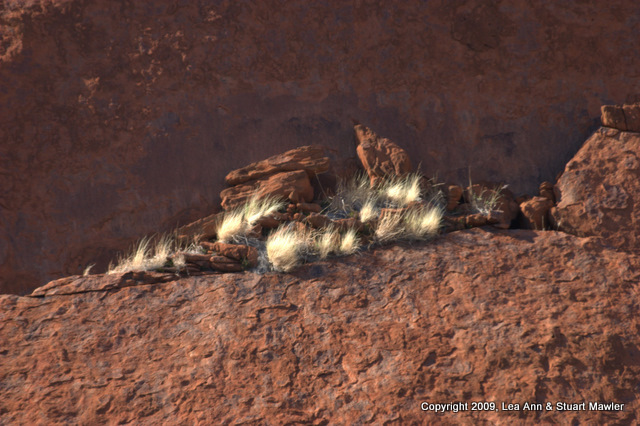 Grasses cling to the side of the rock in some places, slowly breaking down the rock into a future sacred gravel mound. 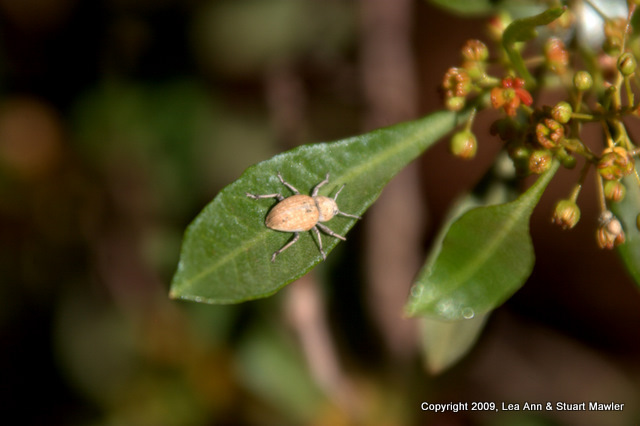 An unidentified bug posing for a nice shot. It is probably a tasty treat, but we did not attempt to find out. This rose-looking flower is actually in focus. 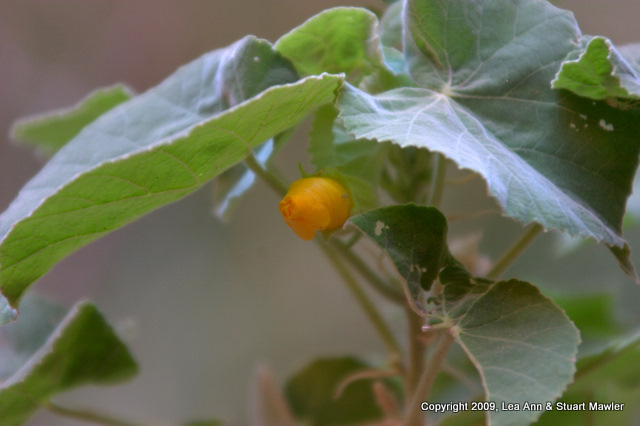 In the larger version, you can see all the tightly-wrapped petals. 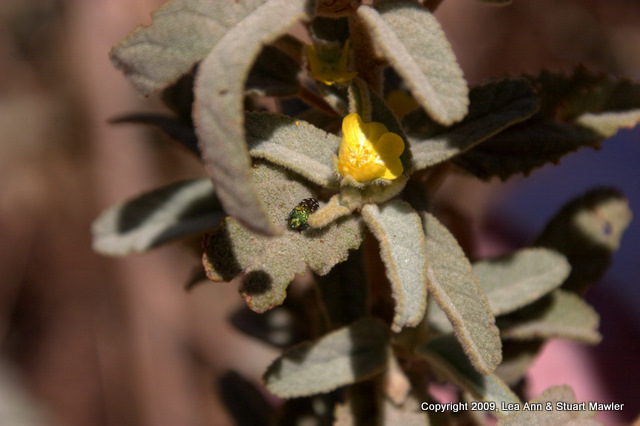 More dusty desert flora with bright flowers. Naturally, a hike that was supposed to last under an hour took us something more like four... If we could pass single linear meter without pausing to take a picture, we might make more progress. The entire time we were on the trail, we were lapped by groups of tourists descending on the area by the bus-load. They only had enough time to run straight to the end, see the Gorge, then turn around the run for the bus. Sounds like loads of fun to us. "Speed Vacationing" or perhaps "Extreme Relaxation". 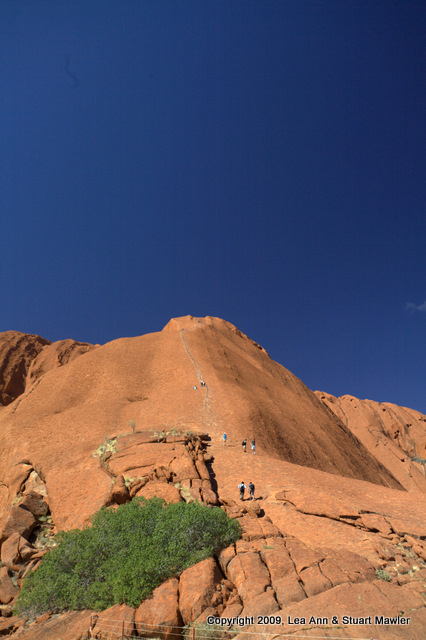 As mentioned earlier, this trail also happens to start at the same spot as the trail to the top of the rock. When we arrived much earlier in the morning, there were no people taking the trip to the top, and as we walked along the rock, it seemed quite peaceful from below. 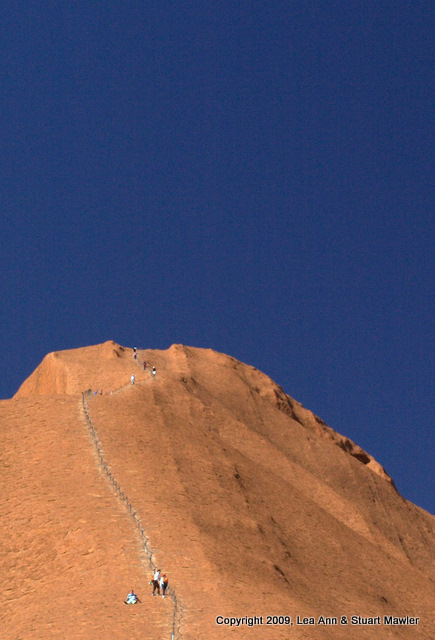 However, on arriving back at the trailhead, it was clear that many folks had taken an interest in reaching the top. It should be noted that all the literature asks you not to climb. 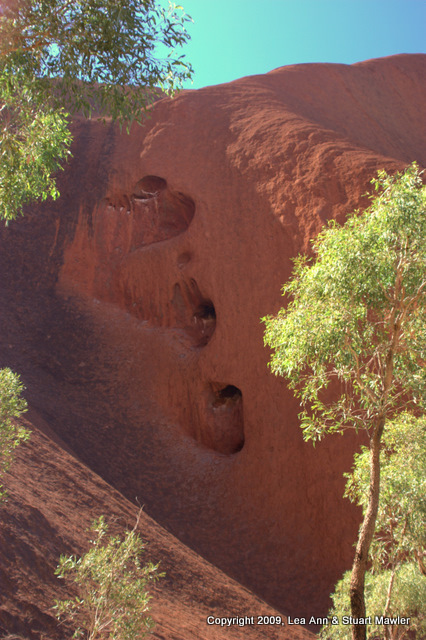 The Aboriginies cite the sacred status of the rock and their unique relationship to it, asking that you respect this and decline to climb. The government is less concerned about spirituality, but does not feel like scraping your toasted and mangled body off the hot surface of the rock. They recommend against climbing for purely practical reasons, though they do provide a list of precautions. We elected to respect the Aboriginal wishes, despite the call of the summit. As you can see from the picture below left, many people elected to make the hike. The scariest part, however, was noting how incredibly unprepared most of these people were. The line up the middle of the picture is a chain that is permenantly fixed into the rock. The chain only starts above the dark crevasse at the lower center of hte frame, and does not extend to the summit. The bottom of the detail to the right is well above the dark crevasse. In this detail, note the person in the lower left of the frame. S/he is sitting down to rest after having only reached the bottom of the chain. Note also that there are people lined up well into the distance. 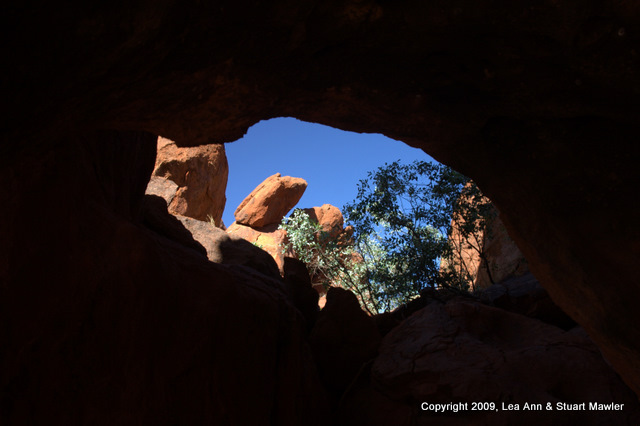 Leaving the summit trailhead, we skirted the rock clockwise, taking few pictures (exactly 13) until reaching the Mutitjulu Waterhole. 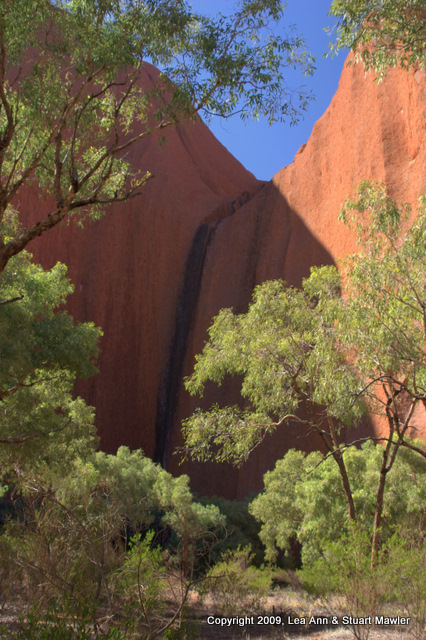 Since water runs off the rock so quickly, it collects in waterholes around the base, creating comparatively lush microclimates. 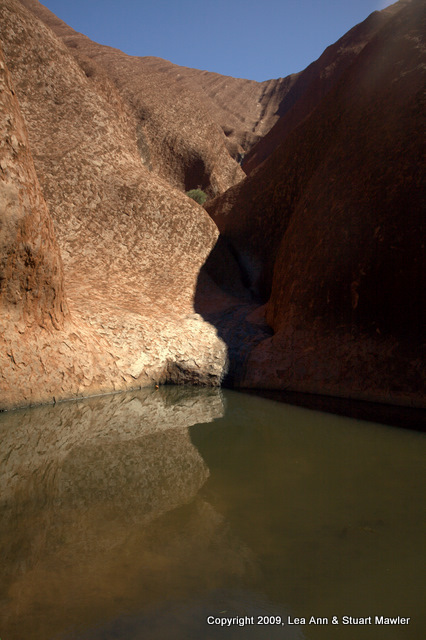 The waterhole is an important Aborginal site for ceremonial purposes, not to mention the fact that it has water. We spent another hour or more just hanging out here, enjoying the day, absorbing the quiet, and taking pictures. 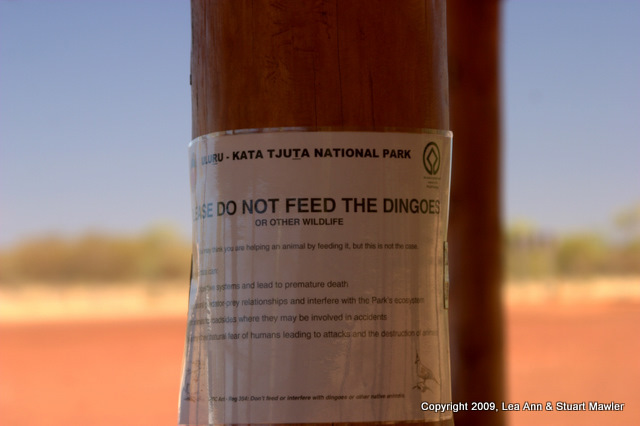 For pete's sake, don't feed the dingoes. How many times have you been told? 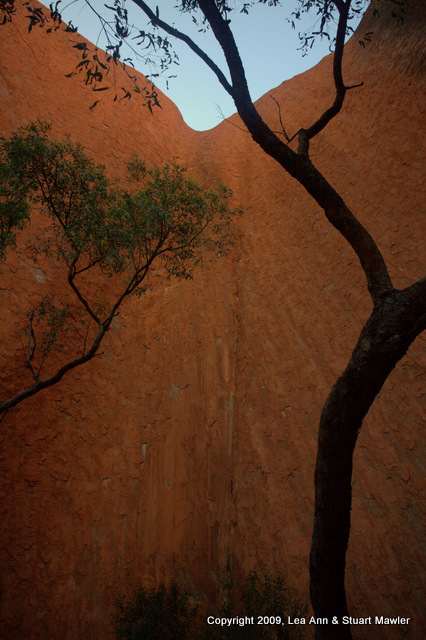 A small cave frames the sky. 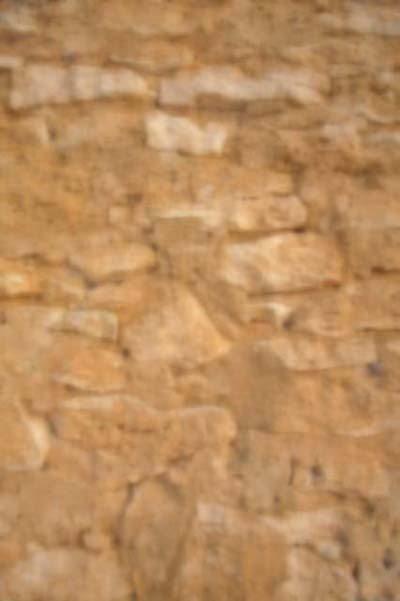 Same thing with fill flash, bringing out the texture of the rock. 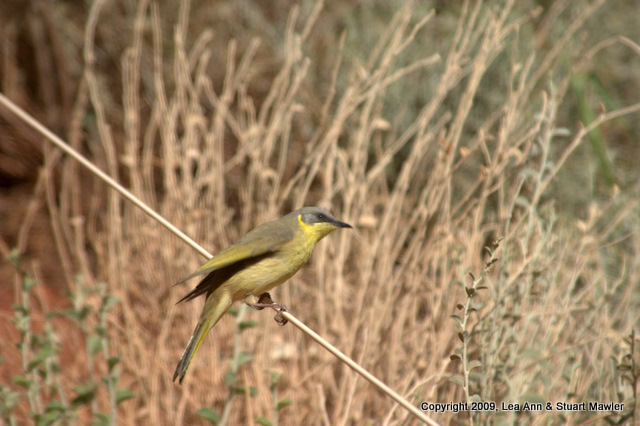 A bird came to pose for Lea Ann. 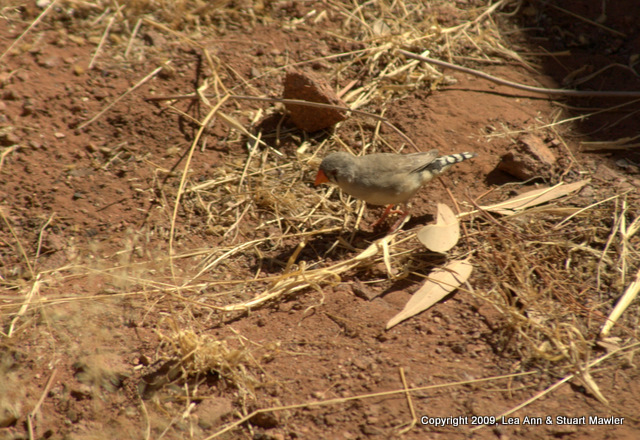 These little guys were not nearly as good at posing, but their orange beaks are quite striking. 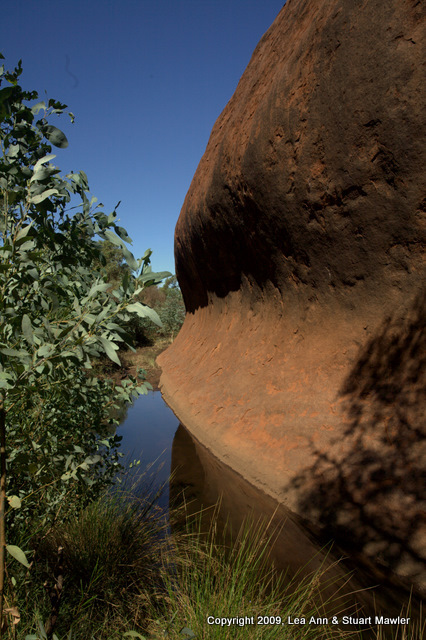 The primary channel, funnelling water to the waterhole. 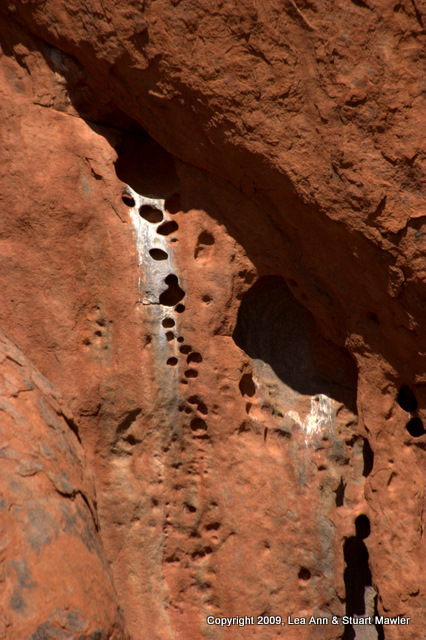 A series of pits in the rock. The top one is widely seen as a heart (in the Valentine's Day cartoon style, leaning toward the right) . We see a hand forming an Indian Mudra in the second one (possibly the Mushti Mudra of "releasing". Anyone want to contribute a thought for the bottom one? 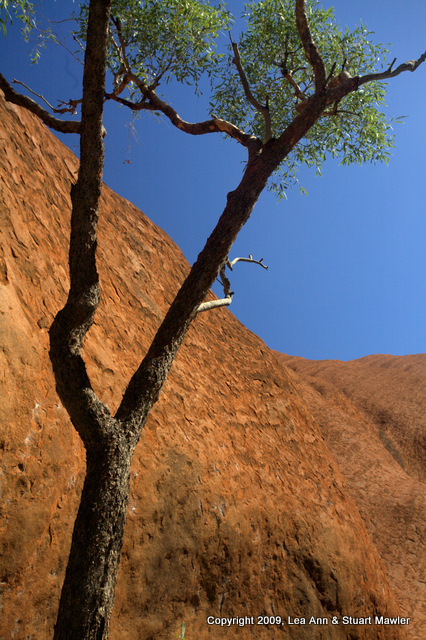 The texture of the rock actually seems like a compliment to the bark of the tree. 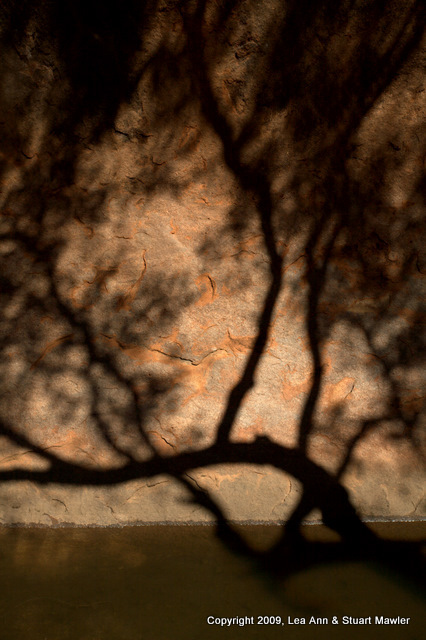 Better yet, the shadows of the tree form a strong, ever-changing graphical element on the rock. In places, the rock and the water conspire to give false perspectives. 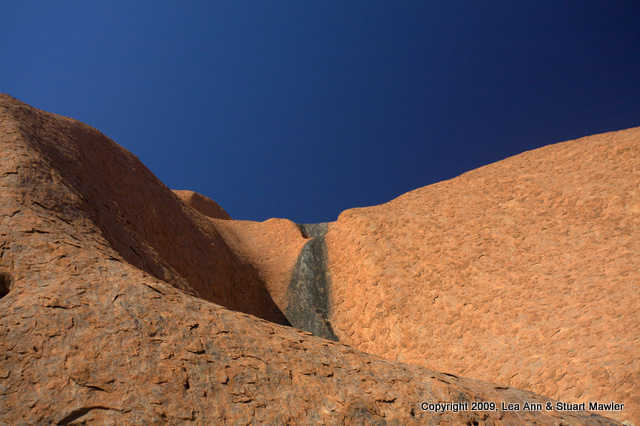 The main waterhole itself is a place of incredible beauty, with sharp contrasts, where the rock and the water meet. 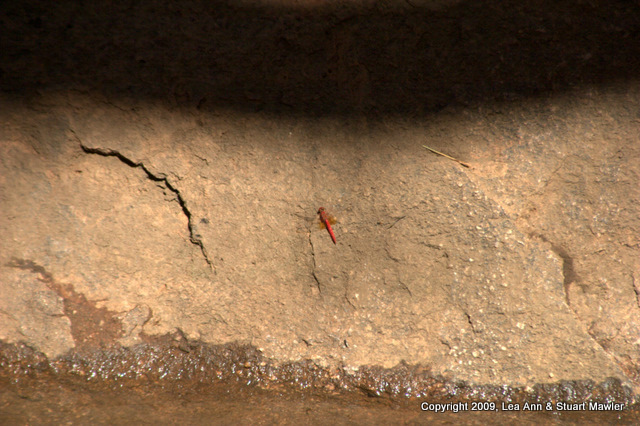 But one of the most captivating parts of the waterhole was the prevalence of small creatures. 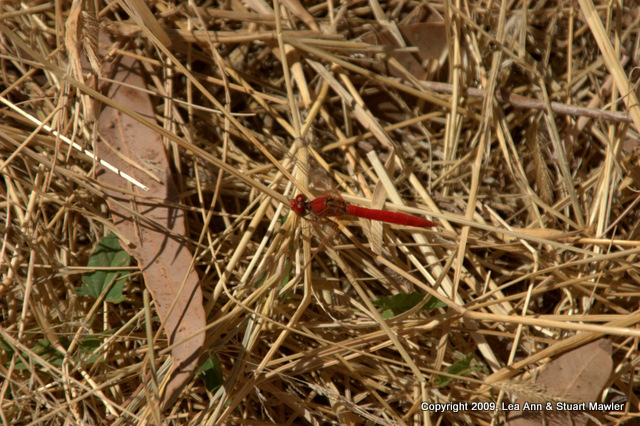 This red dragonfly posed between the water and the shadow. 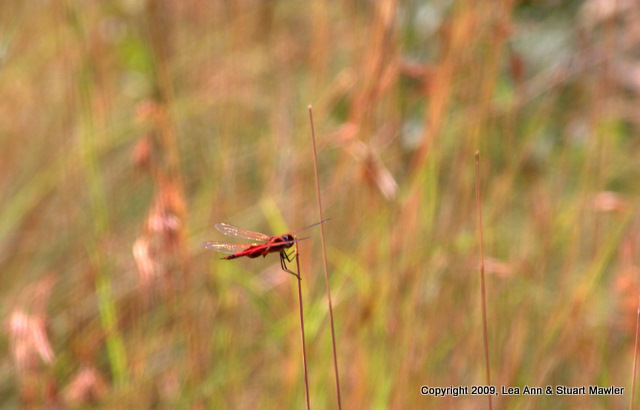 Even amidst the riot of the grasses, red dragonflies are easy to spot. This dragonfly displays a talent for hanging in there. Have you ever tried to take a picture of a free electron? 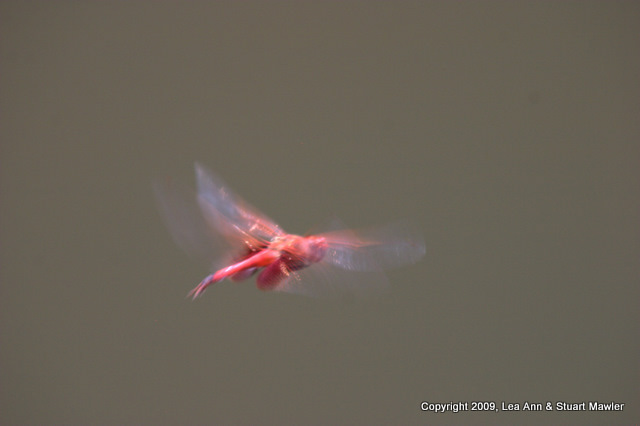 If so, then you have some idea how difficult it is to photograph a dragonfly in flight and how excited Lea Ann was to capture this image. 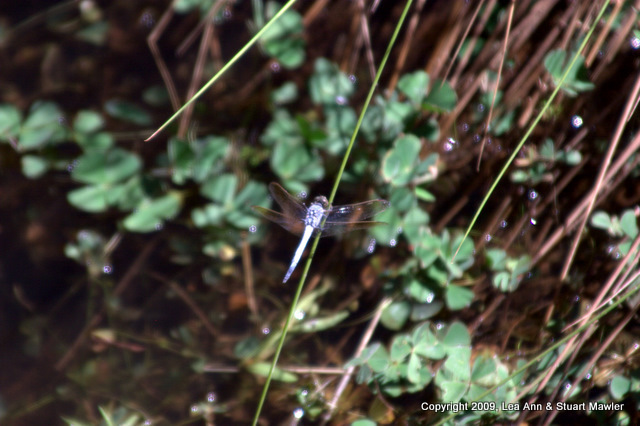 This light blue dragonfly is accompanied by shining drops of water. 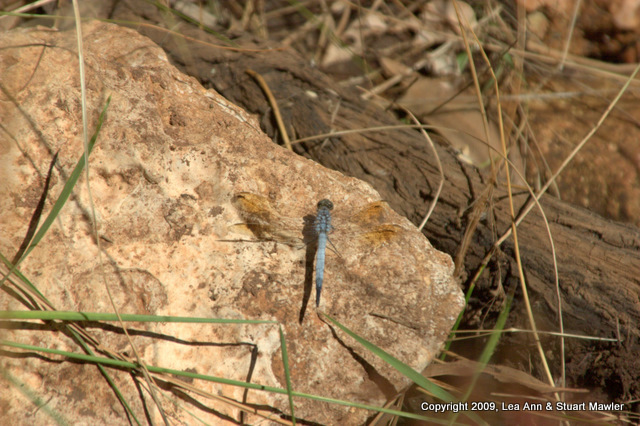 The shape of the rock and the angle of the log seem to perfectly highlight the dragonfly, making this a photograph that just speaks to us. 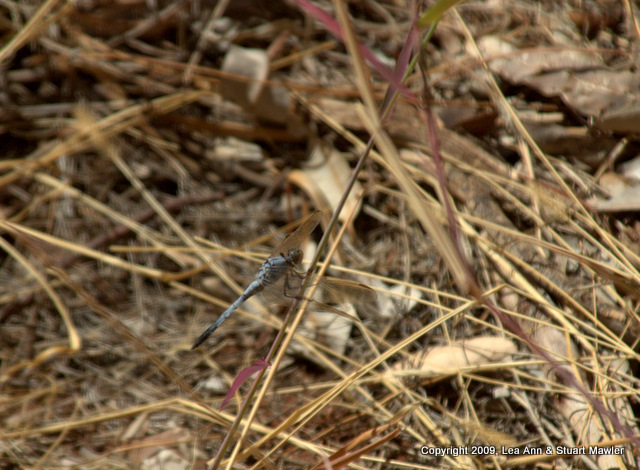 The blue dragonflies also try to disappear among the grasses. 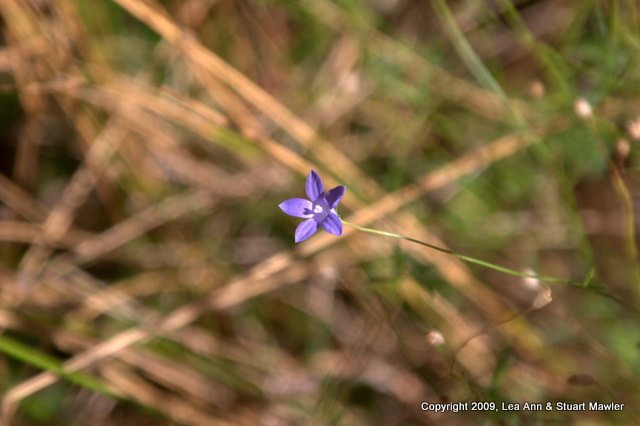 Some dainty flowers also made appearances at the waterhole. This hazy image is one of the most interesting. 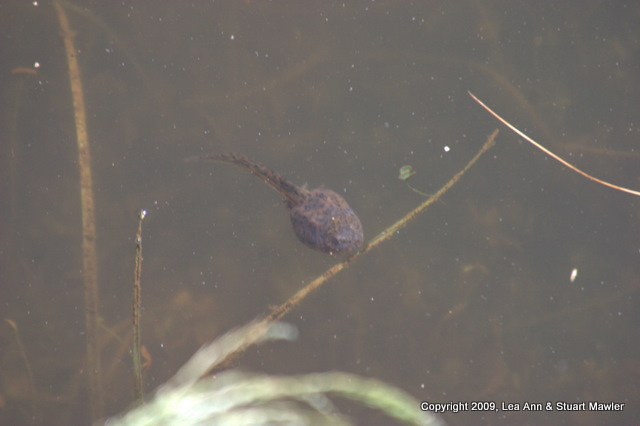 It is an absolutely huge tadpole. While they refused to stand still to be measured, we estimate the body being around two inches. 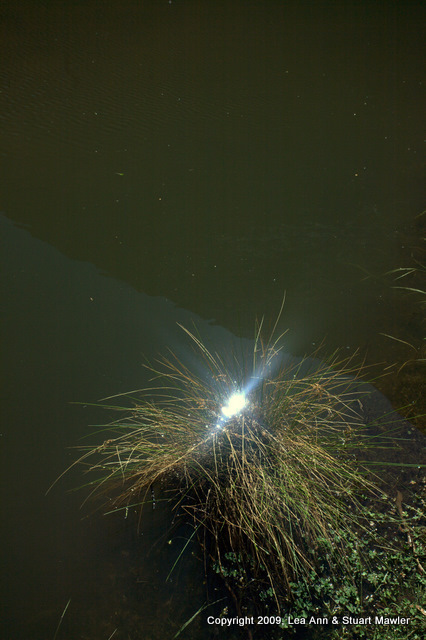 In some ways, this picture sums up the waterhole: the sparkle of sunlight, the reflection of shaded rocks, the marsh grasses. Despite having loads of fun chasing bugs and shadows, we decided to move along, lest we be unable to enjoy any other places. 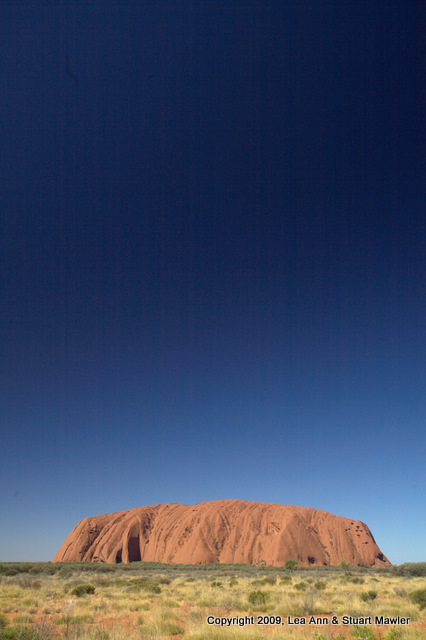 Before heading over the horizon, we stopped to capture our own version of a classic image of Uluru. Well, we didn't get to have the "classic" tour-bus experience, but at least we have the classic picture. 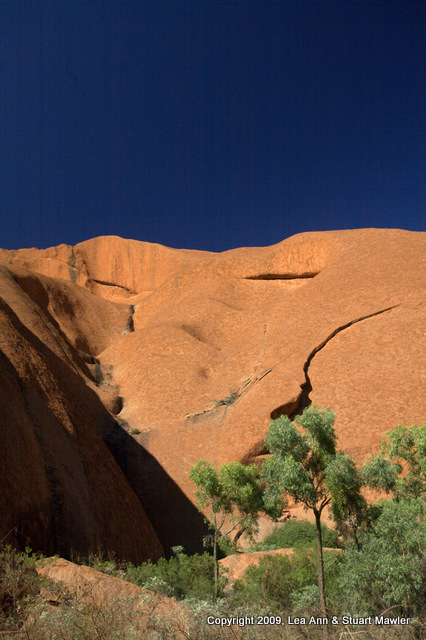 We can now feel good about moving on to Kata Tjuta.